Yes….. that’s right 100 hours on my new aircraft in 8 weeks and nearly 4 of those I spent overseas. Well it started with the delivery of the first two aircraft about 2 weeks before Narromine, The container arrived and the usual group gathered around the back doors as we opened the container to catch the first glimpse of the aircraft on Australian soil, many ohh’s and ahh’s later we had both aircraft safely out of the container and into the hanger ready for assembly in about 30 minutes. The packaging of the aircraft is superb with the aircraft securely bolted into the shipping container on special wooden racks. The wings are supported in cradles the two aircraft had travelled from Slovenia without a mark. The fuselage and wings were completely wrapped in plastic wrap and any supports that contacted the wings or the fuselage in the cradles were covered in special foam. My feeling is the container could have travelled upside down all the way to Australia and the aircraft would be in the same condition, well done Pipistrel. 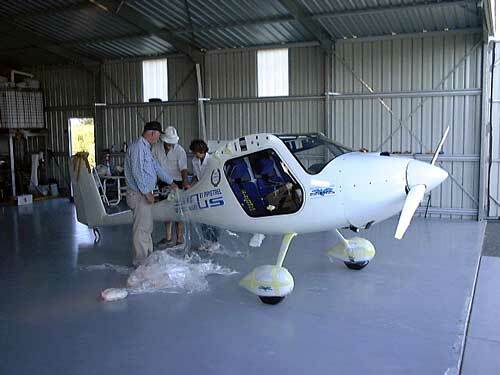 The aircraft were assembled and ready for flight in about 30 minutes with the only tasks being fitting the wings taking 15 to 20 minutes and fitting the tail all of 5 minutes with the rest of the time spent filling the planes with fuel and removing the plastic wrap from the engine which protected it from salt air during the 5 week sea voyage to Australia. 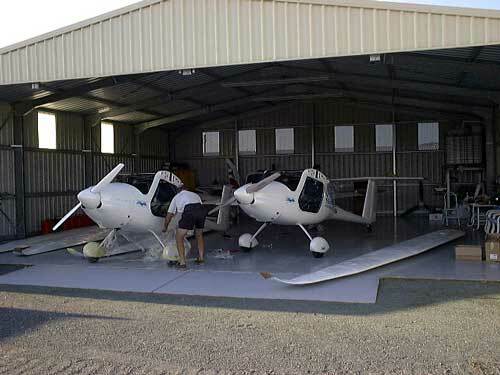 Aircraft into the hanger and ready for assembly after removing all the plastic protective wrap. The finish of the aircraft is superb and our initial inspections of the aircraft gave the thumbs up from all the visitors which gathered around to watch our activities. Oil checked, battery connected, thorough pre flight and I was excitedly yelling ‘clear prop’ when the Rotax 912 sprung to life and settled to a nice idle. All our aircraft are fitted with the Brauniger panel, which seems to reflect the way many savvy pilots are heading with the need for lots of information at a single glance, my initial thoughts on these digital panels which I started using a few years ago were quite reserved but after a few hours you get used to all the information and now I would prefer one of these reliable and light units when compared to the full array of normal flight and engine instruments and the added bonus is a considerable weight saving. Charles – our first Australian Pipistrel Customer takes delivery of the aircraft, one circuit and he flew off for the 600 odd mile trip home. There are several models in the Pipistrel range and our new arrivals were Sinus 15-meter wingspan motorgliders in tailwheel configuration, they are also available in a 15-meter nosewheel configuration and a 12.5-meter nosewheel variant for those with a need for speed…. Let me talk about the speed, both aircraft are being flown in different areas of Australia and we seem to have similar figures with 115 knots cruise for 10.2 to 10.5 litres per hour burn…. Yes, that’s right it’s not a misprint, these are a high performance aircraft. The facts and figures are outstanding and leave our passengers, many with thousands of hours in different aircraft shaking their heads in disbelief, the Rotax 912 80 hp engine on the Sinus is actually detuned to 65 hp because with 80 hp its possible to fly the aircraft past VNE even while climbing at 500 fpm! !, in fact the worst climb I have got two-up with full fuel and luggage has been 800 fpm, most of the time its well above 1000 fpm and by yourself with nothing on board you can maintain 1600 to 1800 fpm up to about 5000 feet when the climb rate starts to slow down. The Virus model with its 12.5-meter wingspan benefits from the full 80 hp on tap and its agility, speed and climb performance almost leaves the Sinus in its wake…. Our first Virus arrives in Australia by mid July and I have about 30 people to ring when it arrives because it’s on the shopping list for many of our customers. 15 meters is a big wingspan but I can still get it into my 12 x 12 meter hanger by myself without any hassle, in fact there is also enough room for a Sting if you pack them in right, so just because you don’t have a huge hanger shouldn’t put you off from considering a Sinus aircraft, the Virus at 12.5 meters will fit a 10 x 10 meter hanger comfortably. Welcomed at Caboolture Gliding Club. The only negative comment we get from the Sinus tailwheel is that forward visibility is restricted whilst on the ground and this is true of the Sinus as it is with many tailwheel aircraft. There is a small cut out on the side of the panel where it meets the windscreen and if you tilt your head slightly to the side there is actually quite good vision in front of the aircraft, its just a technique you need to discover, if you’re a vertically challenged pilot (a nice way of saying short) then I would probably recommend the Sinus in nosewheel configuration because of the added vision and if your really short the seats can be supplied with an additional padding insert. So what’s it like in the air ?? Firstly as a powered aircraft, lining up on the runway with one stage of flap and the stick pushed slightly forward you apply power slowly and the planes tail comes up in a few seconds, instantly the tail comes up you ease the stick back to neutral position and the plane runs along on the main wheels for another second then its up and go, the whole ground run in nil wind at MTOW is about 60 meters on grass and less on tar. Once I rotate the throttle is reduced to about 5000 rpm and set the trim for climb and settle down for the trip, at about 200 feet I slowly take off the one stage of flap and passing the neutral position I move to negative flap for cruise and climb out at 60 knots. Talking about revs, the maximum the engine will rev to is about 5300 rpm because the engine is detuned this also helps make the Sinus the quietest plane at our airfield. I will also add the aircraft is also available with the Rotax 503 and 582 engines for pilots shopping on a budget. The Sinus comes standard with an in-flight adjustable propeller which contributes to the planes impressive performance, at top of climb we reach for the panel and wind a knob which coarsens the propeller for cruise settings, the propeller also feathers to 90 degrees when the aircraft is under glide. 115 knots shows around 4200 to 4400 rpm on the tacho for just over 10 litres per hour with the prop set for cruise. Landing is a non-event but because the plane is so slippery and glides so well it does takes a technique to slow her down, you need to plan your arrivals from a few miles out; first start by bringing the prop from course to fine by winding the prop knob inwards, then drop the throttle back to idle and nose up slightly to slow her down from +100 knots to the 60 I use joining circuit, on downwind you move the flaps from negative to neutral and to one stage on base as you slow to 50 knots which is the ideal over the fence speed, if there is any cross wind or aggressive turbulence I leave it at one stage if its calm and I want to show off the short field abilities I go for the second stage. Here is where this plane gets interesting, from joining circuit to landing you don’t ever use the throttle, there is no need to, you use the air brakes to increase your sink rate in circuit and land on your nominated spot. The airbrakes are fantastic and I reckon every plane needs a set, you open and close them to adjust your glide angle and sink rate, if you coming up short you take them off and the plane glides forever, too high and brakes on full and down you go, with a little practice you will win EVERY spot landing competition. A lot of people ask why you don’t use throttle instead of the brakes and the answer is simple, with such a good glide angle you just cant get down without the air brakes, in fact if your overhead the field at say 1000 feet with a sink rate of less than 200 fpm you have at least 5 minutes before you actually need to land, using the throttle without the air brakes would need an approach angle so low your 5 mile final would start at 500 feet. The flare is just pull the stick back once your in ground effect with the airbrakes on full and the speed drops from 50 to 40 knots for a nice three pointer arrival, if you need to slow quickly the disk brakes stop you really quick, a word of warning is just because your on terra firma don’t take the air brakes off until you have come to a walking pace because if you do the increased lift generated by dropping the air brakes will cause you to fly again and that’s a real surprise the first time you do it. The Sinus excels as a glider and this is where the true versatility of the aircraft becomes apparent, just about any air going up at 200 fpm or more will produce enough lift to gain height, the actual thermalling techniques come quickly once you get a few hints from an expert glider pilot, I have gone one step further and installed a Borgelt vario to take the guess work out of thermalling, this simple instrument has turned me from a novice glider pilot to a thermal hunter, the rewards of making cloud base without an engine leave a smile on the dial for hours afterwards, everyone at the airfield is sick of my stories of doing this and doing that so I take them with me now and I find the enthusiasm can be shared and is contagious. 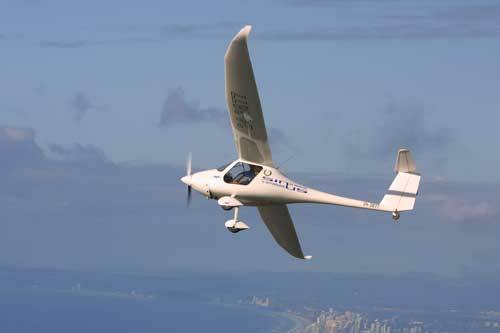 Slope soaring is another technique I have just mastered and many hours have been spent to the range around Mt Warning just south of Coolangatta and also mixing it up with the hang glider guys at Mt Tamborine is fantastic fun. The hang gliders are much slower than the Sinus and I normally slope soar at 50 to 60 knots crabbing along the hills the hang gliders seem to be 30 knots at best so the good visibility from the cockpit in flight is appreciated. When a crowd gathers at Mt Tamborine on a Saturday and Sunday afternoon and there are only a few hang gliders airborne its fantastic fun to drop to negative flap, nose down and speed up to 115 knots and go howling past the launch site waving to all the spectators, nose up and into a steep climb you drop back to one stage of flap and the whole exercise has lost you at most 200 feet but you can make that up on the next run without any problem and then your off again repeating the flypast. Who knows how many wedding photos I have ruined screaming past the launch site with bridal parties lined up for photos on the mountainside. We put the aircraft to the test with gliding’s harshest critics and have flown to the gliding strongholds of Kingaroy, Mc Cafferty field, Boonah, Tyagarah and Caboolture and we been given the thumbs up by the gliding fraternity with some of the most respected people in the sport being entirely supportive and complimentary. 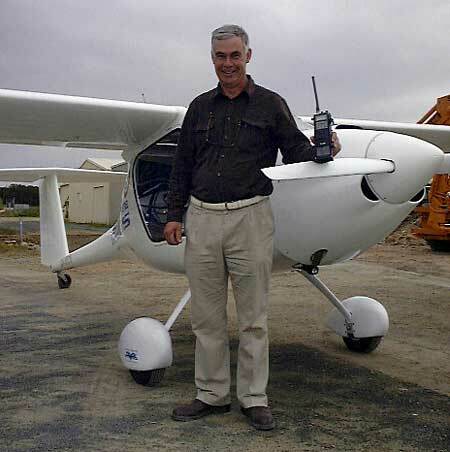 In fact I had a funny experience flying with Shane Mc Cafferty west of Oakey when we went for a fly together, the day was very light and there were about 30 gliders on the ground waiting for the right take-off time, here we were minutes after take-off pulling 800 fpm upwards in a thermal just off the field in Shane’s experienced hands. It was funny to watch the ground, it was like battle stations on an aircraft carrier, people running all directions to get planes airborne as we had marked a great little thermal which would allow them to get away, still I wondered why they didn’t have more motorgliders as they needed so many people to get airborne with tug pilots, ground handlers, safety officers and the like, here we were; turned the key and lucky to use 50 cents worth of fuel before we turned the engine off for a 40 minute flight. Is this the best aircraft ever made?? Well I think it’s up there with the best; its just so much fun, its performance and economy is staggering; get sick of just flying around and you can go and play with some thermals, if the wind is up then you can hit the hills. This aircraft has renewed my enthusiasm in flying and the same happens for the victims I can get in the passenger seat, it’s just bloody good fun!! Registered through the AUF or the GFA the aircraft can be used for training and should find its way into lots of schools where instructors are looking for that something special and economical to run.